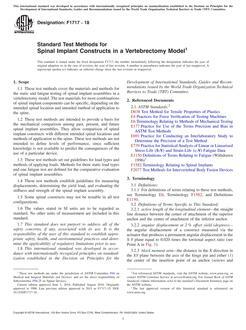 1.1 These test methods cover the materials and methods for the static and fatigue testing of spinal implant assemblies in a vertebrectomy model. The test materials for most combinations of spinal implant components can be specific, depending on the intended spinal location and intended method of application to the spine. 1.2 These test methods are intended to provide a basis for the mechanical comparison among past, present, and future spinal implant assemblies. They allow comparison of spinal implant constructs with different intended spinal locations and methods of application to the spine. These test methods are not intended to define levels of performance, since sufficient knowledge is not available to predict the consequences of the use of a particular device. 1.3 These test methods set out guidelines for load types and methods of applying loads. Methods for three static load types and one fatigue test are defined for the comparative evaluation of spinal implant assemblies. 1.4 These test methods establish guidelines for measuring displacements, determining the yield load, and evaluating the stiffness and strength of the spinal implant assembly. 1.5 Some spinal constructs may not be testable in all test configurations.